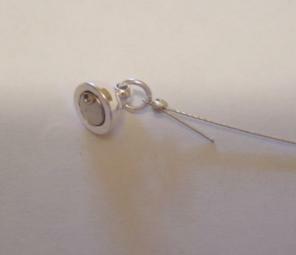 It is easy to make simple loops with head pins or eye pins. 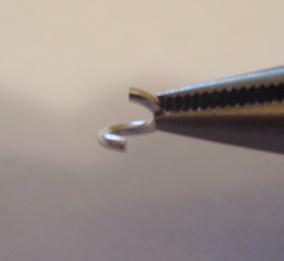 Use your flat nose pliers to bend the wire at a right angle. Bend the wire down as close to the beads as possible. 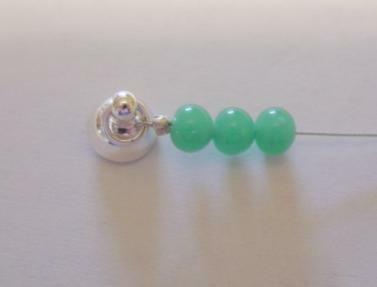 Cut the wire between 1/8" and 1/4" from the beads. This is a matter of preference. The longer you leave the wire the larger your loop will be. I like mine somewhere in between for an average size loop. Grasp the very end of the wire with your round nose pliers. 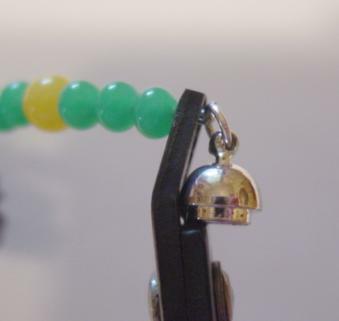 Roll the wire around the tip of the pliers forming a complete circle centered over the beads. If your loop is not completely centered and/or closed, you can come back with your flat nose pliers and straighten and/or close it. 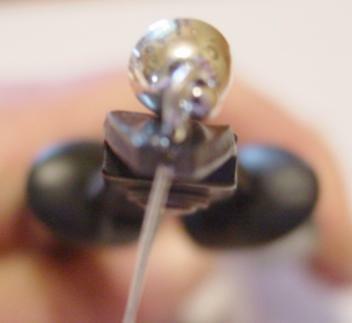 You can make wrapped wire loops with head pins, eye pins or a continuous footage of wire. The gauge depends on your personal preference. However, the gauge that you choose needs to be easily manipulated. 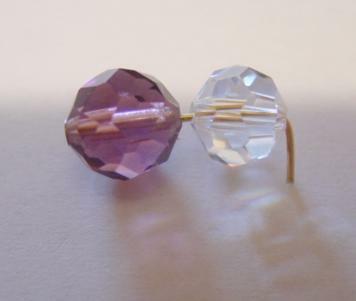 I am using head pins in this example. 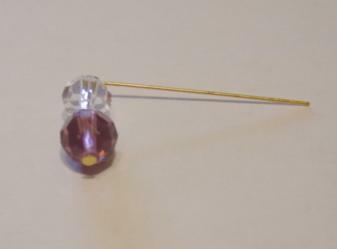 Place beads on head pin. 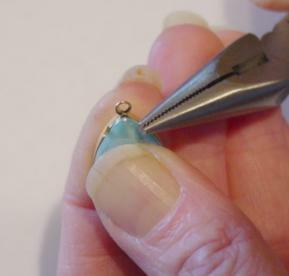 Place your round nose pliers about 1/4" or a little more above the top bead. Use your thumb to wrap the wire all the way around the pliers and form a right angle. Wrap the end of the wire around the wire just below the loop and above the bead/beads. If the wire is soft enough you can do this with you thumb and forefinger. If not you can take your flat nose pliers and grasp the end of the wire to wrap it. The number of times you wrap the wire is a personal preference. I generally wrap the wire around the head pin two to three times. If there is excess wire cut it off close to the head pin/wire and take your flat nose pliers and press the end of the wire flat so that is does not stick out. Never pull the jump rings apart by distorting the circle. Take your flat nose pliers and hold onto one side of the jump ring. Use your thumb or a second pair of pliers to push one side of the jump ring away from you while using the flat nose pliers to pull the other side of the jump ring toward you. 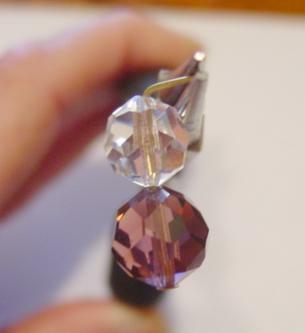 There are a variety of types of settings for rhinestones. The settings for flat back stones are by far the easiest to set. 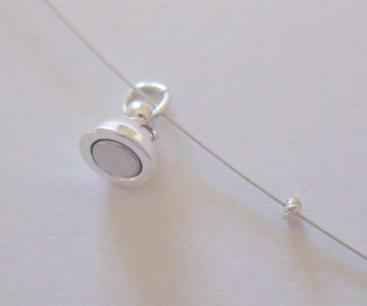 Since there is not point at the bottom of the stone you don't have to worry about the stone sitting straight in the setting. I use the side of my pliers to bend the prongs of the settings. However, there are a number of tools you can use. There is a tool called a stone setter than looks like an Allen wrench with a wooden bulb handle. You use the square end to push the prongs down. A heavy short screw driver or a butter knife will also work. If you have some tough prongs that don't want to bend down easily you can wrap your pliers with tape or short pieces of straws on the tips of the pliers and use the use the jaws of the pliers to bend the prongs flat. I have found that plumbers tape works best. 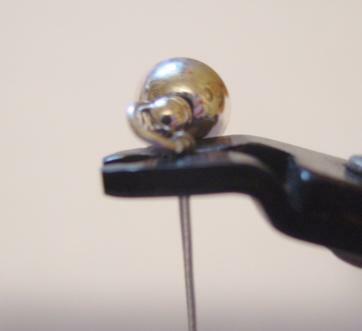 It is not sticky and will not gum up your pliers or leave a residue on your stones or settings. If you have a perfect fit, place your stone in the appropriate size setting. Use your thumb to hold it in place. Bend all of the prongs in toward the stone a little bit. I work in a criss-cross pattern when setting my stones. It tends to keep the stone centered. In other words bend the prong at the top on one side then bend the prong on the opposite at the bottom. The picture shows the prong I start with as number 1 and the one I end with as number 4. 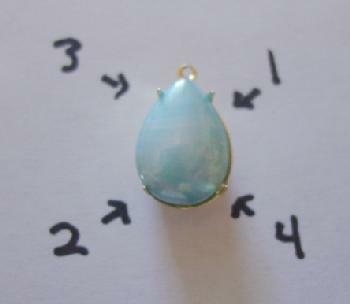 Once the stone is positioned I come back and close the prongs down all the way. 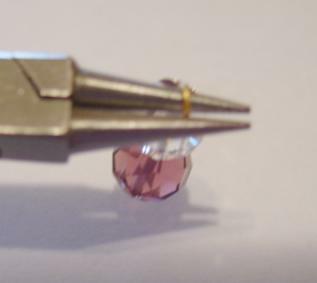 If your rhinestone does not fit absolutely perfect in your rhinestone cup it is sometimes easier to place a little glue in the settings before you place the stone in them. Place the stone inside the setting with the glue making sure that it is sitting straight. Let the glue dry then come back and close the prongs. 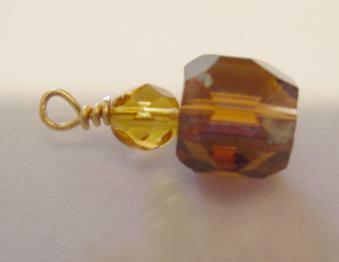 This keeps the stone from moving around while you are trying to close the prongs. Most glues will eat the foil on the back of the stones. If you spend too much time moving the stone around you will end up with a ruined stone. Whether you have plain prongs, fancy prongs, scalloped prongs or crown prongs the same method can be used. 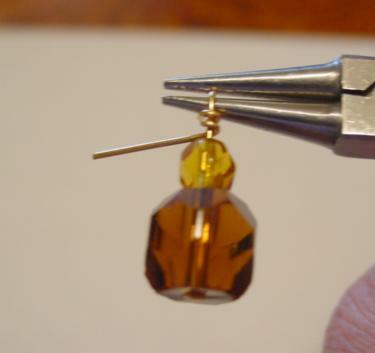 However, transparent stones are a bit trickier since you will be able to see any glue on the parts of the stone that shows. 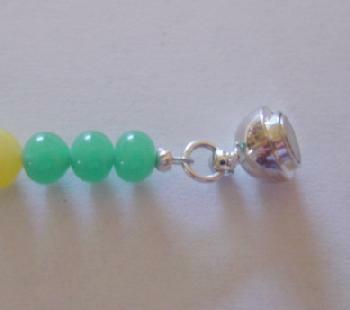 Place a crimp bead on your cord or wire. Run the cord or wire through your jump ring or clasp loop. Then run the cord back through the crimp bead. 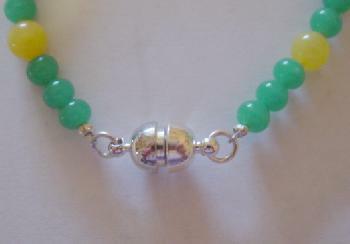 Slide the crimp bead up close to the jump ring or clasp loop. 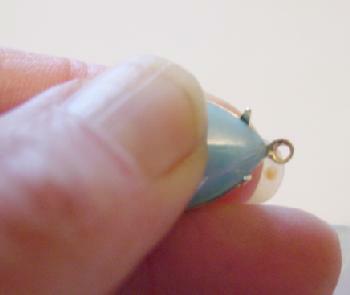 Use the bottom portion of your crimping pliers to crimp the crimp bead. Come back with the crimping pliers and use the top portion of the crimping pliers to round the crimp bead. Cut off excess wire. You may want to leave a little extra to hide behind the beads. 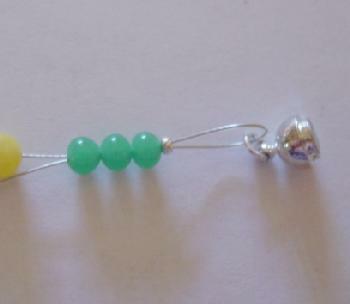 The beads in this picture cover the extra length of wire and provide extra stability. 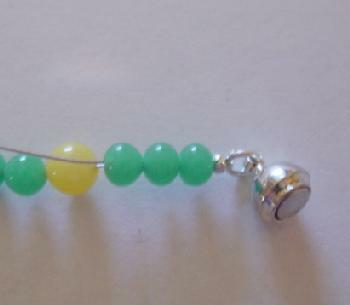 Once you have strung the last bead place a crimp bead on your cord or wire. Run the cord or wire through your jump ring and or clasp loop. This can sometimes be tricky. 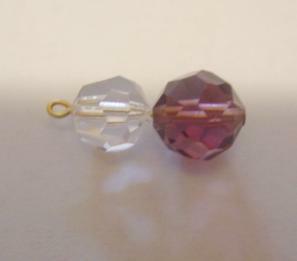 If you don't pull the wire or cord tight enough you will end up with extra space between the beads and crimp bead. 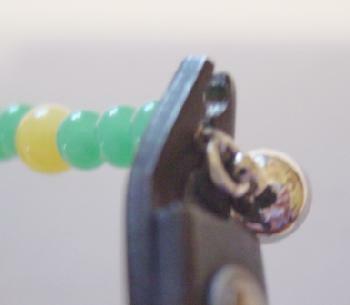 To get the wire or cord tight I have found that if you take your flat nose pliers and hold onto the end of the wire just above the crimp bead (make sure it is the end with the beads on it) and use your fingers to pull the loose end you can get the crimp close to the beads with little extra space. 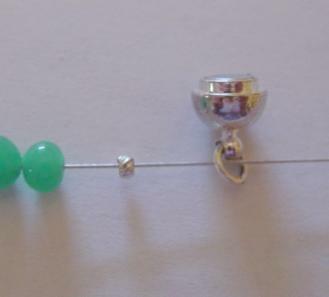 After you have pulled the wire through the beads and have it tight cut off the excess wire. 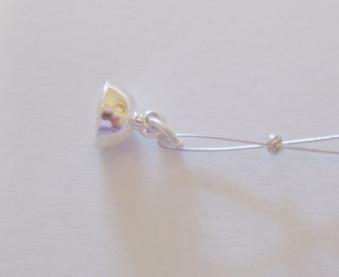 If you pull the last end tight you should have a professional looking finish for your bracelet or necklace. There is (almost) no such thing as a bad stone. When dealing with vintage stones you will run into situations where the foil back stones are cloudy or the foil is scratched and the stones appear to be unusable. What I do with these stones is remove the foil and use them in open back settings. Once you remove the foil you generally have great stones. 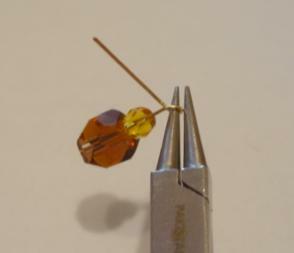 It is easy to remove the foil from stones. I generally put them in a glass bowl to let them soak in vinegar and salt. The ratio is about 1 cup vinegar with 1 tablespoon salt. Some stones will let loose of the foil over night. Some will take several days. Most times I just take a large batch of stones and leave them for a week to soak. Once the foil has let loose of the stones you can just run water over them and drain off the pieces of foil. Lay the stones on a tray lined with a towel or paper towels to dry. You now have stones that are useable.